Commemorations have taken place in France and Northern Ireland to mark the 102nd anniversary of one of the bloodiest battles of the First World War. Hundreds from both Northern Ireland and the Republic of Ireland travelled to northern France to remember those who fell at the Battle of the Somme. Northern Ireland Secretary Karen Bradley led the tributes at the Royal British Legion service at Thiepval, and the Somme Association services at the Ulster Tower and Guillemont. “It is important that we remember all those from across the island of Ireland who gave their lives for our freedom during the First World War,” Ms Bradley said. “The Battle of the Somme in particular has an indelible link with Northern Ireland given the remarkable bravery shown, and the scale of the sacrifice made, by the 36th (Ulster) Division and the 16th (Irish) Division. “It is difficult for us to comprehend the horror that these men faced as they went forward into battle, but their contribution and sacrifice was immense and we should never, ever forget it. 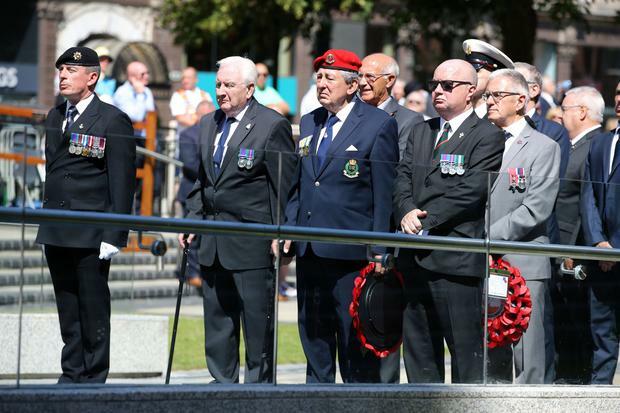 In Belfast, Deputy Lord Mayor Emmet McDonough-Brown led the Somme commemorations at City Hall. “It was a personal and political privilege to lead the procession on behalf of the citizens of Belfast,” he said. The procession at a wreath laying ceremony to mark the Battle of the Somme in the grounds of Belfast City Hall. Photo by Kelvin Boyes / Press Eye. Lord Mayor of Belfast Deidre Hargey laid a wreath at the City Hall War Memorial on Sunday morning. Press Eye - Belfast - Northern Ireland - 1st July 2018 Battle of the Somme Commemoration The Anniversary of the Battle of the Somme, in which Officers, Non-Commissioned Officers and Men of the 36th (Ulster) Division, the 16th (Irish) Division and other forces made the supreme sacrifice, is commemorated at the Cenotaph in the Garden of Remembrance, Belfast City Hall grounds. The Under Secretary of State for Northern Ireland Minister Shailesh Vara MP and Deputy Lord Mayor Emmet McDonough-Brown at a wreath laying ceremony to mark the Battle of the Somme in the grounds of Belfast City Hall. Photo by Kelvin Boyes / Press Eye. Press Eye - Belfast - Northern Ireland - 1st July 2018 Battle of the Somme Commemoration The Anniversary of the Battle of the Somme, in which Officers, Non-Commissioned Officers and Men of the 36th (Ulster) Division, the 16th (Irish) Division and other forces made the supreme sacrifice, is commemorated at the Cenotaph in the Garden of Remembrance, Belfast City Hall grounds. A wreath laid by Deputy Lord Mayor Emmet McDonough-Brown at Belfast City Hall. Photo by Kelvin Boyes / Press Eye. Press Eye - Belfast - Northern Ireland - 1st July 2018 Battle of the Somme Commemoration The Anniversary of the Battle of the Somme, in which Officers, Non-Commissioned Officers and Men of the 36th (Ulster) Division, the 16th (Irish) Division and other forces made the supreme sacrifice, is commemorated at the Cenotaph in the Garden of Remembrance, Belfast City Hall grounds. Her Majesty's Lord Lieutenant for the County Borough of Belfast Fionnuala Jay-O'Boyle and Irish Minister for Business, Enterprise, and Innovation Heather Humphries at a wreath laying ceremony to mark the Battle of the Somme in the grounds of Belfast City Hall. Photo by Kelvin Boyes / Press Eye. Press Eye - Belfast - Northern Ireland - 1st July 2018 Battle of the Somme Commemoration The Anniversary of the Battle of the Somme, in which Officers, Non-Commissioned Officers and Men of the 36th (Ulster) Division, the 16th (Irish) Division and other forces made the supreme sacrifice, is commemorated at the Cenotaph in the Garden of Remembrance, Belfast City Hall grounds. DUP deputy leader Nigel Dodds MP with Gavin Robinson MP and Emma Pengelly MP at a wreath laying ceremony to mark the Battle of the Somme in the grounds of Belfast City Hall. Photo by Kelvin Boyes / Press Eye. Press Eye - Belfast - Northern Ireland - 1st July 2018 Battle of the Somme Commemoration The Anniversary of the Battle of the Somme, in which Officers, Non-Commissioned Officers and Men of the 36th (Ulster) Division, the 16th (Irish) Division and other forces made the supreme sacrifice, is commemorated at the Cenotaph in the Garden of Remembrance, Belfast City Hall grounds. Ulster Unionist Party leader Robin Swann at a wreath laying ceremony to mark the Battle of the Somme in the grounds of Belfast City Hall. Photo by Kelvin Boyes / Press Eye. Press Eye - Belfast - Northern Ireland - 1st July 2018 Battle of the Somme Commemoration The Anniversary of the Battle of the Somme, in which Officers, Non-Commissioned Officers and Men of the 36th (Ulster) Division, the 16th (Irish) Division and other forces made the supreme sacrifice, is commemorated at the Cenotaph in the Garden of Remembrance, Belfast City Hall grounds. The Under Secretary of State for Northern Ireland Minister Shailesh Vara MP at a wreath laying ceremony to mark the Battle of the Somme in the grounds of Belfast City Hall. Photo by Kelvin Boyes / Press Eye. Press Eye - Belfast - Northern Ireland - 1st July 2018 Battle of the Somme Commemoration The Anniversary of the Battle of the Somme, in which Officers, Non-Commissioned Officers and Men of the 36th (Ulster) Division, the 16th (Irish) Division and other forces made the supreme sacrifice, is commemorated at the Cenotaph in the Garden of Remembrance, Belfast City Hall grounds. The Band of the Royal Irish Regiment at a wreath laying ceremony to mark the Battle of the Somme in the grounds of Belfast City Hall. Photo by Kelvin Boyes / Press Eye. Press Eye - Belfast - Northern Ireland - 1st July 2018 Battle of the Somme Commemoration The Anniversary of the Battle of the Somme, in which Officers, Non-Commissioned Officers and Men of the 36th (Ulster) Division, the 16th (Irish) Division and other forces made the supreme sacrifice, is commemorated at the Cenotaph in the Garden of Remembrance, Belfast City Hall grounds. Irish Minister for Business, Enterprise, and Innovation Heather Humphries at a wreath laying ceremony to mark the Battle of the Somme in the grounds of Belfast City Hall. Photo by Kelvin Boyes / Press Eye. Press Eye - Belfast - Northern Ireland - 1st July 2018 Battle of the Somme Commemoration The Anniversary of the Battle of the Somme, in which Officers, Non-Commissioned Officers and Men of the 36th (Ulster) Division, the 16th (Irish) Division and other forces made the supreme sacrifice, is commemorated at the Cenotaph in the Garden of Remembrance, Belfast City Hall grounds. Her Majesty's Lord Lieutenant for the County Borough of Belfast Fionnuala Jay-O'Boyle at a wreath laying ceremony to mark the Battle of the Somme in the grounds of Belfast City Hall. Photo by Kelvin Boyes / Press Eye. Press Eye - Belfast - Northern Ireland - 1st July 2018 Battle of the Somme Commemoration The Anniversary of the Battle of the Somme, in which Officers, Non-Commissioned Officers and Men of the 36th (Ulster) Division, the 16th (Irish) Division and other forces made the supreme sacrifice, is commemorated at the Cenotaph in the Garden of Remembrance, Belfast City Hall grounds. The procession at a wreath laying ceremony to mark the Battle of the Somme in the grounds of Belfast City Hall. Photo by Kelvin Boyes / Press Eye. Press Eye - Belfast - Northern Ireland - 1st July 2018 Battle of the Somme Commemoration The Anniversary of the Battle of the Somme, in which Officers, Non-Commissioned Officers and Men of the 36th (Ulster) Division, the 16th (Irish) Division and other forces made the supreme sacrifice, is commemorated at the Cenotaph in the Garden of Remembrance, Belfast City Hall grounds. The Royal Irish Regiment at a wreath laying ceremony to mark the Battle of the Somme in the grounds of Belfast City Hall. Photo by Kelvin Boyes / Press Eye. Press Eye - Belfast - Northern Ireland - 1st July 2018 Battle of the Somme Commemoration The Anniversary of the Battle of the Somme, in which Officers, Non-Commissioned Officers and Men of the 36th (Ulster) Division, the 16th (Irish) Division and other forces made the supreme sacrifice, is commemorated at the Cenotaph in the Garden of Remembrance, Belfast City Hall grounds. Members of the public at a wreath laying ceremony to mark the Battle of the Somme in the grounds of Belfast City Hall. Photo by Kelvin Boyes / Press Eye. Press Eye - Belfast - Northern Ireland - 1st July 2018 Battle of the Somme Commemoration The Anniversary of the Battle of the Somme, in which Officers, Non-Commissioned Officers and Men of the 36th (Ulster) Division, the 16th (Irish) Division and other forces made the supreme sacrifice, is commemorated at the Cenotaph in the Garden of Remembrance, Belfast City Hall grounds. The military colour party at a wreath laying ceremony to mark the Battle of the Somme in the grounds of Belfast City Hall. Photo by Kelvin Boyes / Press Eye. Press Eye - Belfast - Northern Ireland - 1st July 2018 Battle of the Somme Commemoration The Anniversary of the Battle of the Somme, in which Officers, Non-Commissioned Officers and Men of the 36th (Ulster) Division, the 16th (Irish) Division and other forces made the supreme sacrifice, is commemorated at the Cenotaph in the Garden of Remembrance, Belfast City Hall grounds. Deputy Lord Mayor Councillor Emmet McDonough-Brown at a wreath laying ceremony to mark the Battle of the Somme in the grounds of Belfast City Hall. Photo by Kelvin Boyes / Press Eye. Press Eye - Belfast - Northern Ireland - 1st July 2018 Battle of the Somme Commemoration The Anniversary of the Battle of the Somme, in which Officers, Non-Commissioned Officers and Men of the 36th (Ulster) Division, the 16th (Irish) Division and other forces made the supreme sacrifice, is commemorated at the Cenotaph in the Garden of Remembrance, Belfast City Hall grounds. General view of a wreath laid earlier in the day on behalf of the Sinn Fein Mayor of Belfast in the grounds of Belfast City Hall. Photo by Kelvin Boyes / Press Eye. Press Eye - Belfast - Northern Ireland - 1st July 2018 Battle of the Somme Commemoration The Anniversary of the Battle of the Somme, in which Officers, Non-Commissioned Officers and Men of the 36th (Ulster) Division, the 16th (Irish) Division and other forces made the supreme sacrifice, is commemorated at the Cenotaph in the Garden of Remembrance, Belfast City Hall grounds. The Under Secretary of State for Northern Ireland Minister Shailesh Vara MP with Deputy Lord Mayor Emmet McDonough-Brown at a wreath laying ceremony to mark the Battle of the Somme in the grounds of Belfast City Hall. Photo by Kelvin Boyes / Press Eye. “Unsurprisingly I am very mindful of the hurt and pain that occurs when lives are lost. In my own family, I am proud of my grandfather who fought fascism as a pilot with the RAF in World War Two, and also of my great uncle who died just before Armistice Day as a medical orderly. DUP MPs for east, north and south Belfast, Gavin Robinson, Nigel Dodds and Emma Little-Pengelly, were among the others to lay wreaths at the cenotaph. Belfast Lord Mayor Deirdre Hargey laid a laurel wreath shortly before the official service, following the tradition of Sinn Fein members in the top city post. The Battle of the Somme started on July 1 1916. The first day of the battle remains the bloodiest in the history of the British Army. Some 19,240 troops – including many from both Northern Ireland and the Republic of Ireland – were killed within 24 hours. The Ulster Tower is dedicated to the soldiers of the 36th Ulster division while a Celtic cross in Guillemont is in memory of men from the 16th Irish division who died fighting in the nearby fields. The gardai failed to achieve over half of its commitments set out in last year’s policing plan, a report has found.